Your Captain can supply you with the very best equipment available whether it be fly or spin. If you would rather use your own we would be happy to advise you on what to bring depending on what type of charter you book. Fly fishing gear runs from 6 to 12 weight depending on conditions and quarry, rigged with primarily intermediate, floating, and occasionally and fast sink tip lines for some offshore applications. Spinning gear is 7 to 7 1/2 foot medium fast action rods rigged with 10 to 15 pound test capable of working light surface and subsurface lures. A smooth drag is paramount. 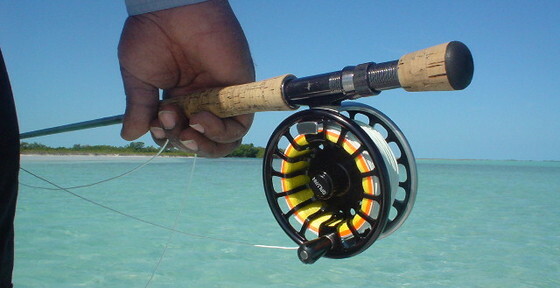 Polarized sunglasses and light colored clothing is recommended for sight-fishing to reduce visibility to fish in the shallows. Amber tinted or brown have been found to give the best results for glassesin the shallows, while gray works fine offshore. SUNSCREEN is a must for all places. We generally supply all terminal tackle(flies or lures) , however if you want to try your own patterns or ties, bring them along. If wade fishing is something you may wish to do, high top wading/flats boots and or light weight waders may serve you well.